Over the next few days I’ll be posting my impressions and comments regarding the San Rafael SMART Station Area Plan. It’s such a large, complicated, and potentially game-changing document that it needs more than just a single post. Today we tackle the interplay of cars, bikes, and pedestrians. So far, we’ve covered land use and parking, and the last post will cover buses and the future of the site. The SMART Downtown Station Area is set in a car-centric environment, complete with an elevated freeway and its ramps, pedestrian barriers, dead street frontage, narrow sidewalks, and open lots. There is no traffic calming, little in the way of bicycle infrastructure, and a push to move more and more cars through. This is a transit-oriented development, deliberately focused around means of getting around that don’t include a car. While it does not address needed bus improvements, the Station Area Plan tackles the other issues by building needed infrastructure for walking and cycling. It takes a step back by altering the street network to accommodate more traffic, giving one San Rafael Planning Commissioner “heartburn”, but overall the plan is solid where it chooses to look. Highway 101, built as an upgrade to the old Redwood Highway to speed cars to the Golden Gate Bridge and San Francisco, bisects San Rafael. Irving and Heatherton are functionally the frontage roads, one-way strips running north and south respectively, and Second and Third are the on and off ramps, running one-way east and west respectively. This poses immense problems for active living, as a glorified freeway ramp is no place to put a pedestrian or a bicycle. Car lanes are 12 feet wide, as wide as a freeway lane, but facilitating speed. Timed lights to keep traffic moving and encourages driving at the speed limit but contributes to noise and the perception of danger. There are no traffic-calming measures that I can think of. For a transit-oriented community this is problematic, but it is understandable given the geography. In most other cities, traffic is funnelled through specific arterials on a wide grid, though if there is a problem on one street, others nearby can soak up the spillover. San Rafael is the primary freeway entrance for Ross Valley, and the whole of downtown is only five blocks wide. Speeding 24,000 cars per day on and off the freeway is a huge challenge for San Rafael, and this is a way to address the problem. With more density coming to this area, the Area Plan has proposed adding right-turn lanes off Heatherton to Third, increasing the outbound capacity and allowing the roads to keep flowing freely. Unfortunately, the plan proposes doing this while removing a crosswalk along Heatherton to prevent pedestrians from interfering with traffic flow. This is foolish in the extreme, despite the improved bus travel times. 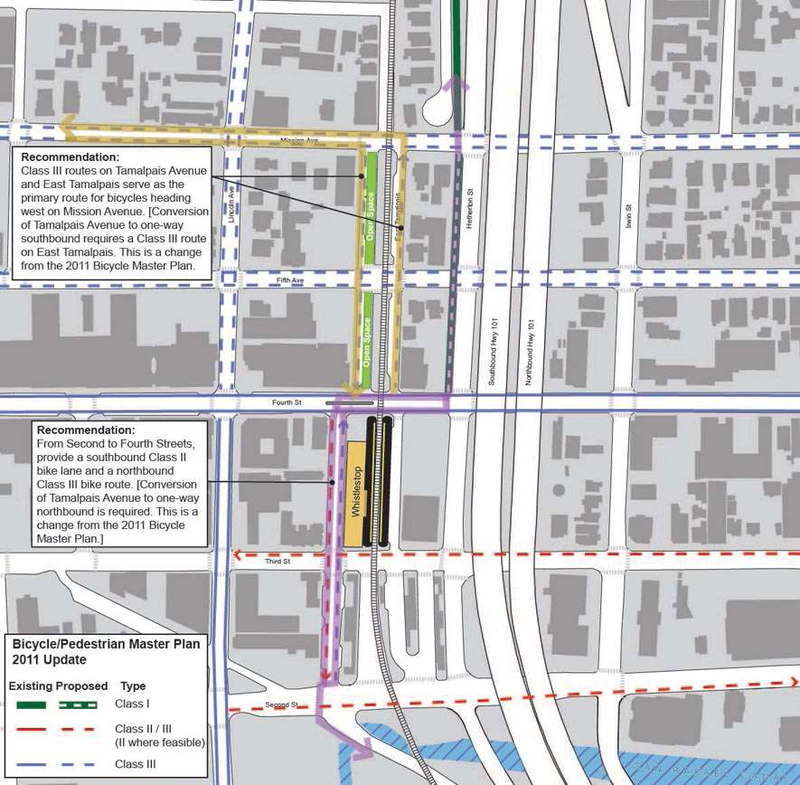 Most traffic through this area is pass-through, and there is more than enough capacity on Mission, Fifth, and Fourth to absorb the increase in westbound traffic from these projects. San Rafael needs to focus on calming Second and Third rather than simply pushing more cars through, especially here. Proposed bicycle improvements. Click for full size. I remember reading a blog comment once to the effect of, “I’ve been car-free in Fairfax for years, but only because I have a bike.” Golden Gate Transit has somewhat thin service for being a car replacement so bicycle ownership is a must for the car-free, and this is almost as true in San Rafael as it is in Fairfax. Improving the bike-unfriendly areas around San Rafael, especially under the freeway and along Second and Third, are absolutely essential to allow car-free travel around Marin, and the bike lanes included in the plan accomplish at least a bit by facilitating the bicycle connection between Irwin and the multi-use path behind the San Rafael Corporate Center. MCBC has called for a Class I bike lane (or multi-use path, what the rest of the country calls a cycletrack) on West Tamalpais instead of the planned bike lane on East Tamalpais. This is another good idea to be explored, as cycletracks would go a long way to promoting bicycling in all parts of Central Marin, and a good one on West Tamalpais could be a model. 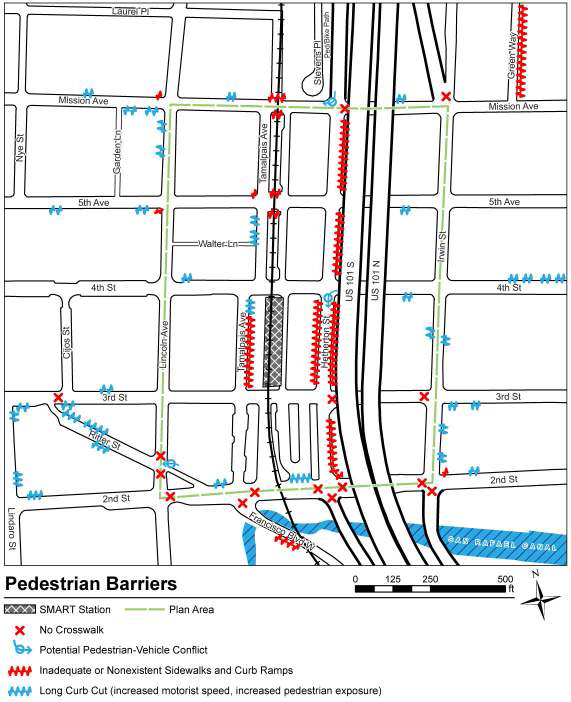 Present pedestrian barriers to be resolved. Click for full size. Walkability is the foundation of a livable neighborhood, a fact acknowledged by the Area Plan. Walking around the Transit Center is a pain, with missing crosswalks, long curb-cuts, and pedestrian barriers at key intersections. 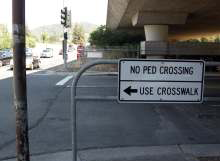 Walking under the freeway is unpleasant, especially at night, and the narrow sidewalks put the cars far too close to pedestrians. To solve this, the Area Plan calls for more crosswalks, removal of extraneous curb-cuts, and widening or adding sidewalks throughout the area. Unfortunately, the most pressing pedestrian problem is handled in an astonishingly ham-fisted sort of way. When SMART arrives, it will be directly across Third from the Transit Center, and there are huge desire lines running between the two facilities. San Rafael, concerned that people would run across Third to catch their bus, wants to erect a pedestrian barrier along most of the length the station’s Third Street side, forcing pedestrians to cross at either Heatherton or West Tamalpais, eliminating mid-block crossings from East Tamalpais by commuters desperate to catch their bus. This is the opposite of pedestrian-friendly. A far better solution would be to initiate a block-long crossing, starting 30 seconds after a train pulls up and lasting 45 seconds, during which time cars would be unable to turn right. As SMART will run only once every half-hour, it would not be too disruptive of bus and car traffic, and Heatherton traffic would still be able to move south during the crossing. To prevent commuter desperation, buses should be instructed to wait a short time after the train arrives, and SMART itself should have real-time departure information displayed in the train for buses at whatever its next stop is. Overall, the mobility issues addressed by the Station Area Plan are quite large and are handled competently. Beyond the bizarre pedestrian barrier, removed crosswalk, and new right-turn lane at Third and Heatherton, walkability and bikeability are improved dramatically under this plan. In our fourth and final installment, we’ll tackle buses and the future of the area. I’d welcome cycling options that get cyclists clear of the stop-and-go of 4th Street, but I’m extremely skeptical of MUPs. Experienced high speed cyclists have no place mixing with pedestrian traffic, and the existence of a MUP tends to raise the “get off my road” sentiment in automobile drivers (see, for example, cycling along Magnolia in Larkspur). For a while I lived in Fairfax and commuted to Berkeley, riding in to San Rafael, catching the 40 across the bridge, and then either biking down the Bay Trail or going all the way to Richmond BART and riding along the trail under that. The BART trail was actually divided into pedestrian and bicycle lanes, but without someone writing tickets to keep the pedestrians off of the bike-only sections, meant that there were constant slow-downs to deal with pedestrians who were meandering all over the “bikes only” marked lanes. The Bay Trail was further and had wind (and required riding through some sketchy parts from Point Richmond over to Marina Bay), but was preferable because once you got clear of Marina Bay the people density was low enough that the other users were trying to get somewhere too. Which made the “multi-use” part reasonable (serious runners who keep right are fine). But that’s not the geography of San Rafael. So unless it’s a dedicated bike path, and pedestrians who try to use it are routinely ticketed, I suspect that MUPs in densely populated areas have a long-term negative effect on cycling for transportation (see also the effects of cul-de-sac development patterns on non-automobile traffic). Yeah, I’m thinking something more like this or this. Real MUPs seem… well, they seem like they’re for a time when biking was mostly recreation.